The Floating Empire: No S**T, The joys of the composting toilet. Okay, first of all, I'll say this again, what I have to tell people, ad infinitum ad nauseum: No, it doesn't smell. It amazes me why on earth anyone would mess with blackwater systems, pumpouts, incinerator toilets, luggable portapotties with holding tanks you have to empty, when they could just use a bucket and a sawdust toilet. This thing has proven so very easy to live with, so very easy to do, that I'm almost surprised anything else exists. Our toilet is simple: We have a 5 gallon bucket. We cut off the top rim of it so it would sit inside ANOTHER 5 gallon bucket. 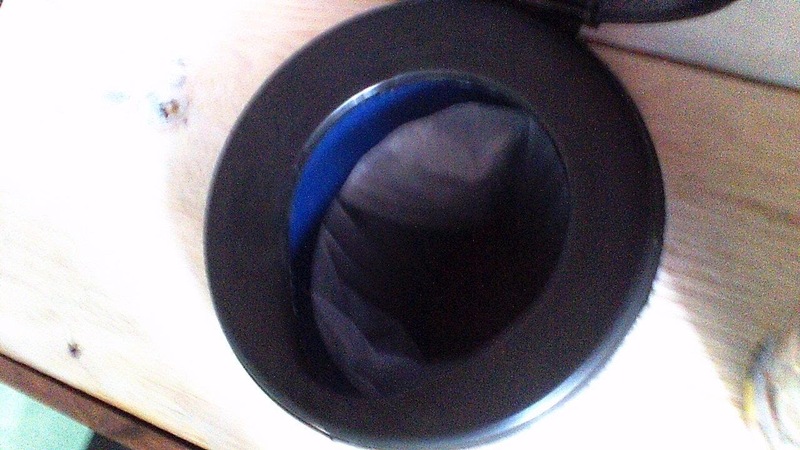 So the top 1/3 or so bucket is affixed to the toilet box cover and the lower one sits below, kept aligned to the upper one by the nesting design of these things. This also keeps the liner in place. We line the lower toilet with a biodegradable bag and put 2" or so of either sawdust or wood pellets (more on this later) in the bottom. We have a snap on toilet seat and cover made by LuggableLoo on the top bucket section, which gives us both a toilet seat and a snug closure. 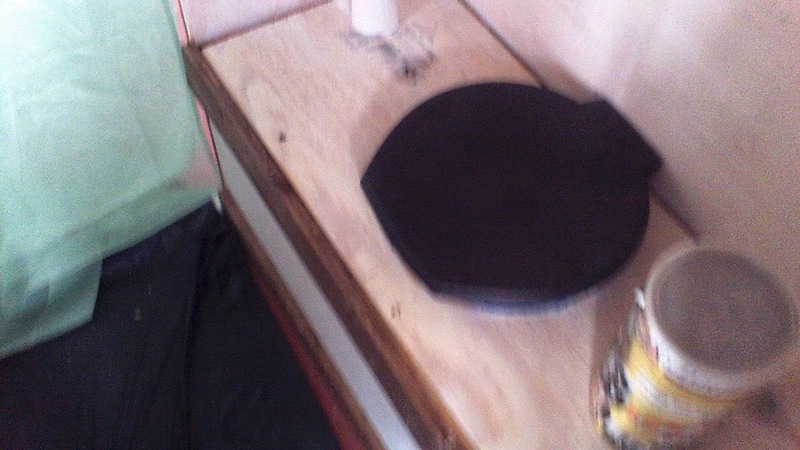 Here's the snap on toilet seat from LuggableLoo. You can also see the upper and lined lower buckets. Whenever you use the toilet, you throw in a handful of absorbent material. We've used crushed dry leaves, sawdust (not from treated lumber....it inhibits the decomposition process), pine based cat litter (don't use the clay stuff), and wood stove pellets. As long as you throw in enough to lightly cover what you just...uh...left, there's no odor except one of damp wood. No, really, it doesn't smell. It doesn't. Not at all. My Cat box smells more than the toilet does. When the lower container is 3/4 full, we pull it out and either put it in the compost bin or throw it in a dumpster (can you do that? What do you think happens to all those disposable diapers?). The last time I tossed it in a dumpster, the bag broke. It looked like a pile of wet oatmeal, no odor but one of decomposing wood, no loose liquids at all. So then you reline the lower bucket, toss in another 2" of material, and you're ready to continue. With the two of us living on the boat, we dump the thing about every 5 days or so. 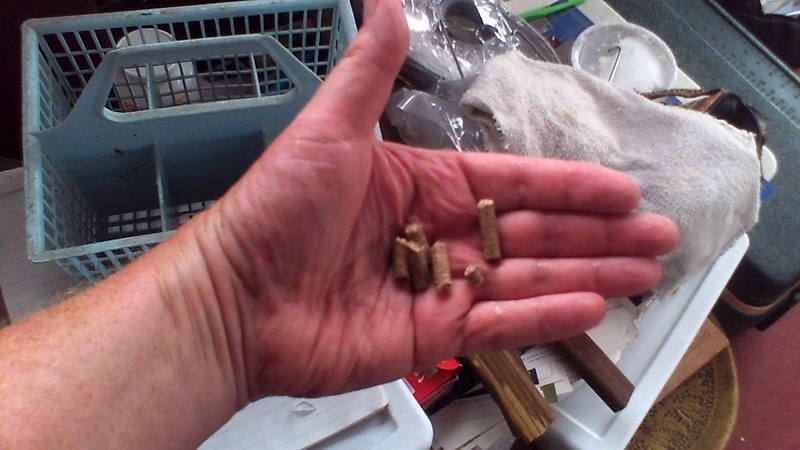 As for the biomass, our big accidental find was the hardwood pellets for pellet stoves. Yes, these things. Compressed hardwood sawdust made for pellet stoves. We got a bag of the stuff for use in our gasifier stove, and when we ran out of sawdust, I remembered what happened at the big box store at which I had been working when one of the bags of the stuff broke and got wet. The compressed pellets, made of hardwood sawdust, expanded as they absorbed the water. 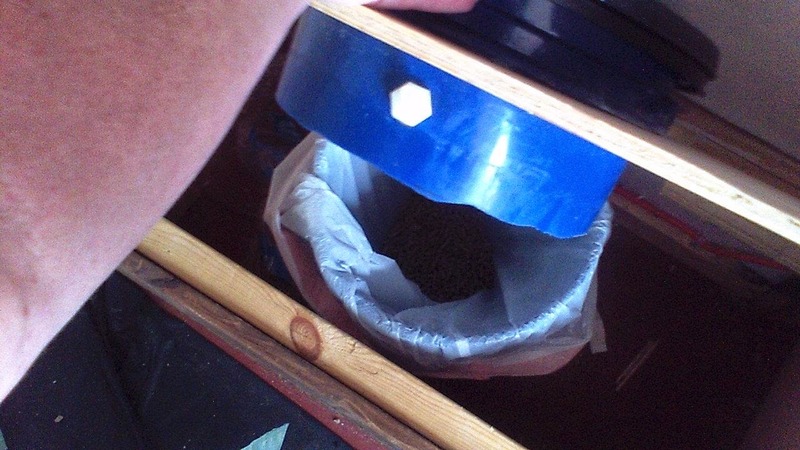 As a result, the pellets are a good deal more compact than sawdust to carry and store, but expand rapidly to absorb any moisture from the compost and seem to decompose just fine. Better, a bag of the stuff is about $5 for around 40 lbs., which will last you months. Be sure to get the "natural" kind that doesn't use oil as a binder and has no other additives, and be aware that not all the pellets are compressed hardwood. Some are cherry pits or other materials. Read the bag. Thanks Janice. For those of you not in the know, check out Janice's excellent live aboard blog at http://janice142.com/, she has some great information there. Let's face it, best composting toilet are a very complex and little understood product. Many consumers don't even realize that compost toilets are actually odorless and present a great eco-friendly alternative for residential homes in urban and suburban areas.